It all started in the 1980’s after having listened to a radio programme in which Ms Kajsa Vedin from Gothenburg, herself very active from a union point of view and the author of an excellent analysis entitled “In the shadow of a microchip” (about the occupational risks involved in computer-based work), asked for expertise in neurology. As a neuroscientist I thought I was close enough, and I strongly believed that the issues she wanted to highlight, using the conventional repertoire of scientific “tools”, ought to be easily investigated. I did not realise at all that there were other forces not wanting to see such studies initiated, but very soon I understood that these very clear-cut and simple and obvious investigations proposed by Kajsa Vedin would be very, very hard to start. The same type of propositions soon were brought forward by many other persons including the two journalists Gunni Nordstrom and Carl von Schéele, who later published their first book, “Sjuk av bildskarm” (“Ill from VDT work”; Tidens Forlag, 1989, ISBN 91-550-3484-5). Unfortunately, most of these proposed studies are still not brought into life, 15 years later. Ted Kennedy, Johnny Cochran, Gro Harlem Brundtland brain tumors, electrical hypersensitivy? Gro Harlem director-general of the World Health Organization. A medical doctor with a master’s degree in public health, as well as former prime minister of Norway, she has recently been speaking in public about her own sensitivity to computers, cordless phones and cell phones. 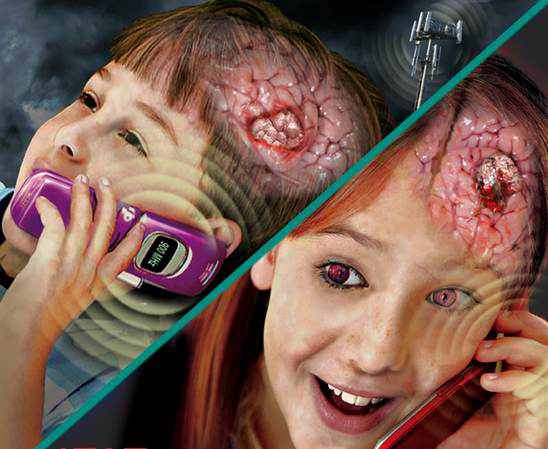 Not only has she warned parents against allowing their children to use cell phones or microwave ovens, but she said that she herself has become so sensitive to the radiation that she does not allow anyone to enter her office with a cell phone turned on. Mabye, ted and Johnny coiuld have learned something from her and many others. My right ear did not clear and I lost the hearing in my ear. I proceeded to treat myself for a few days with no success. Sought medical care and the doctor said I had a very slight irritation in my ear but the ear canal was closed to 1/3 its normal size. He told me to discontinue using the bluetooth; treated, and I now have about 75% of hearing back but still have a constant white noise in my ear. Can’t say this was actually caused by the bluetooth but don’t want to take any more chances. In Germany the Government quoted in a press release the following “A cordless phone of DECT standard is often the strongest source of high frequency electromagnetic radiation in a private home. To renounce your cordless phone as a precautionary measure will contribute to minimise your personal radiation exposure.”. The best solution is go back to a wired phone in the home, but their are alternatives cordless phones sold in Europe that switch off their microwave radiation between calls – see Orchid Low Radiation phones on the web ? “If you have trouble sleeping, you should think about not talking on a mobile phone right before you go to bed. The study strongly suggests that mobile phone use is associated with specific changes in the areas of the brain responsible for activating and coordinating the stress system,” he added. Does the Qlink Pendant really work for cell phone and cell tower protection? In addition to on-course benefits, the new Q-Link bracelets and popular pendants promote better overall sleep and alleviate symptoms of jet lag common among international Tour players, business and leisure travelers. They have also been shown to decrease the negative effects from today’s popular electronics, such as mobile phones and computers.